So, last week I started planning a new quilt. I even ordered fabric for it, but that deserves a post of its own. Crazy, I know, considering all the quilt tops I have in progress or waiting around to be quilted. Yes, I know I'm a bit ill. To satisfy these new quilty thoughts I pulled out the last quilt top I was working on - the red zig-zaggy chevron top. I never finished it because I ran out of the fabric I was using as the border. I bought more fabric long ago, but never touched it. All weekend that quilt top sat there on the chair, taunting me. 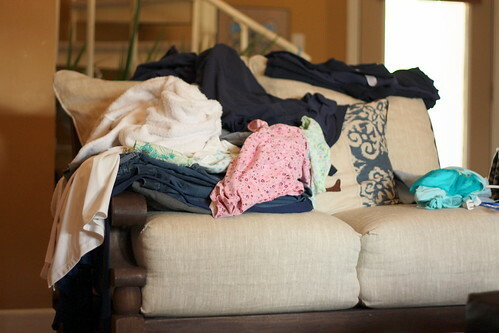 Like most weekends, my days were filled with housework, things to do, and laundry. 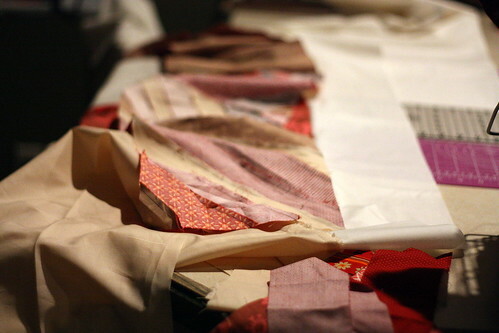 There was little time for quilting. I did manage to tackle some major dust bunnies, but only because I rearranged my bedroom and had no other choice. Man, the stuff that accumulates under the bed is gross! Finally on Sunday night after the kids were in bed, as I was settling in to watch Mad Men, I decided that it was time. I finished that quilt top. All I had to do was add the border on 3 sides. Yep, 3 stinking seams. It's silly that I put it off for so long. Since that took so little time, I went ahead and pieced the backing. Now my quilt is all ready to go - and I'm up wayyyy too late, but I had to stay up late anyway to finish the school uniform laundry (so what if I got a little side tracked and forgot about it while I was sewing). If all goes well and I manage my time, I just may have a finished quilt by the end of the week - just in time for that new fabric to have arrived at my door. Here we are, Friday again. Yet another week has flown before my eyes. Truly amazing. I'm not complaining about all the possibilities of another weekend before me, but I wish I knew where my week went! I suppose I should just get used to this, especially with the kids getting older and more involved in their own activities. Before I get too depressed thinking about that, how about some gratitude? Ava's constant smile. Even when she is in a bad mood, that smile will come out eventually. finally turning my ISO off automatic - duh! what's the point of shooting in manual mode with automatic ISO?? the camaraderie of my piggy peeps *oink* just knowing you're not alone makes a world of difference, doesn't it? watching my Lily blossom before my eyes. She's growing up *so* fast. I'm so happy that she still thinks the world of me. watching Ruby slide down the slide - that dog cracks me up - I must get that on video! I could go on and on about all the little things that make me smile, but I don't want to bore you. It's the weekend, life is good. Happy weekending, friends! Okay, I have a little confession. Last week, in an overwhelmed state of dealing with back to school and trying to cook healthy meals (have I not mentioned that I'm trying to lose a few?) and trying to not let our house turn into a total pig sty, I had a little hissy fit. Most of it was over the messiness of the house and lack of help. But I got over it and I'm trying to do better. 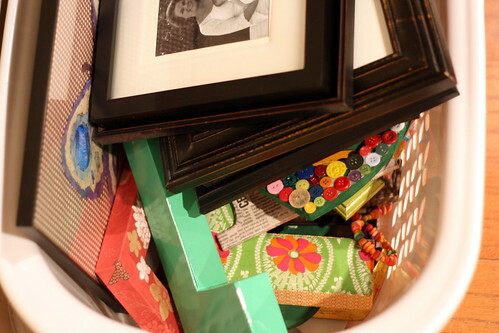 I spent most of the weekend cleaning up, trying to organize and throwing stuff away. It was exhausting. And you know what? My house doesn't look all that different. What the??? That's not fair!!! Every night I've been picking up and doing the dishes and trying to do a load of laundry, but it doesn't seem to be making things any better. 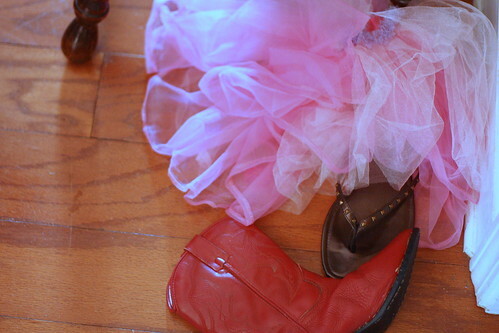 I guess I need to accept that life [with kids & dog] is messy and we are a family of pigs. Oink. I think from now on I'll use my time more wisely, like for sewing...or knitting...or painting :) My dirty floors & laundry can wait. If you ever decide to drop by, give me a few minutes notice...and don't look behind the shower curtain, okay? Okay, so I didn't get a whole lot of creative sewing done this weekend. What I ended up doing was a whole lot of laundry and housework. Oh, the glamorous life I lead! By Sunday afternoon I needed to do something, so I set up shop on the kitchen counter and started making catch-up quilt blocks. I had 6 blocks to catch up on. That seemed a little overwhelming, so I decided to work on half of them, starting with the most over due first. These are all for members of the Pieced Together quilting bee. First up, Edith requested circles. That was the only criteria. It took me a few failed attempts to come up with something, but I ended up with reverse applique circles. This one certainly exercised my creative muscles. 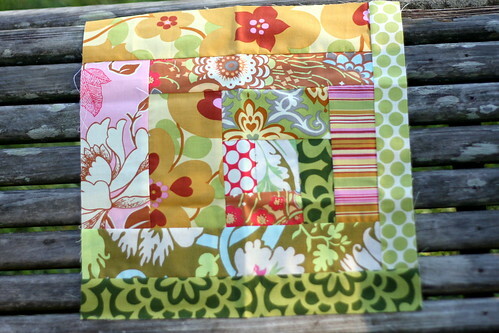 Next, Kathy requested for a scrappy log cabin block. Easy enough. 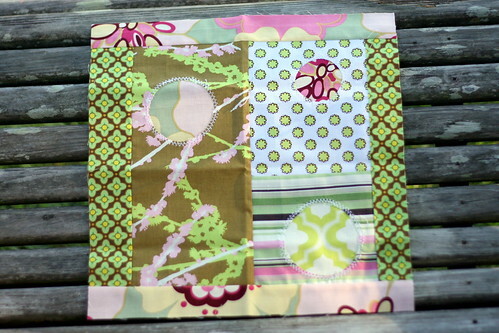 I loved all the Amy Butler fabrics she sent, so this one was a pleasure. And lastly, a Stephanie wanted a spiderweb block. Again, I loved the fabric that was sent. Although I've done a block like this before, I had trouble remembering how to do one. 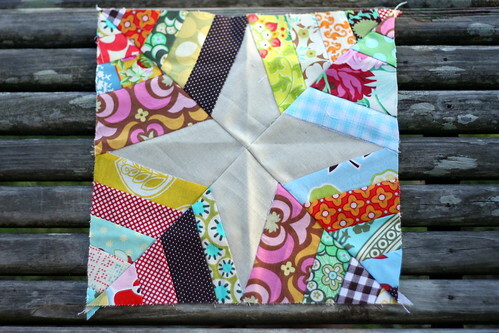 I'm pretty sure I did the paper piecing wrong, but the block looks okay. 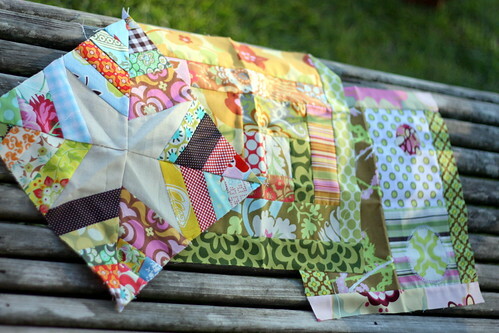 Next time I attempt a spiderweb block using paper piecing, I'll need a refresher. I don't feel like I got nearly enough done and wanted to do much more, but I'll take what I can get. Hey there. I didn't mean to slip away for a few days, but this has been a tough week. 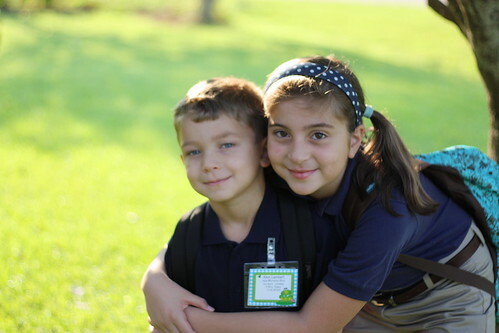 This was our first full week of school with 2 kids in school and a football coach husband, so it was a bit crazy. We're adjusting. That time of day when the kids and I first get home and they're all hungry and the dog needs to go out and homework needs to be done and supper needs to be started and everyone needs my attention and Matt is at football practice is also the time of day when I used to blog. So, as you can imagine, blogging hasn't been happening. By the time everything gets settled, I'm done for the night, for now, at least. As soon as I get used to our new schedule, I'll find my groove. One positive that has come out of all this is that my kids have been going to bed on time, an early time, so I do get to have some evening time to myself. 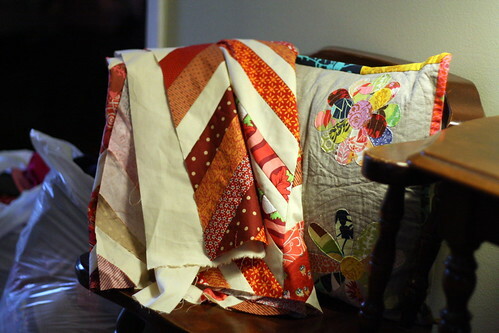 Now that most of my home dec sewing out of the way, I've got bags and quilts on the brain. I'm even thinking about making some bags to put in my shop, maybe. 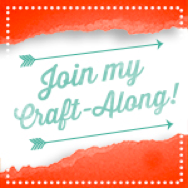 I am also sorely behind on my quilting bee blocks, so I think I have have a block fest this weekend. 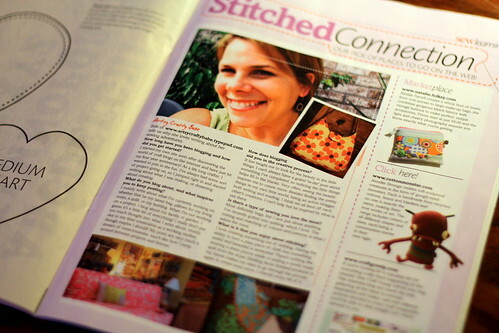 No matter what, I need to do some creative sewing. 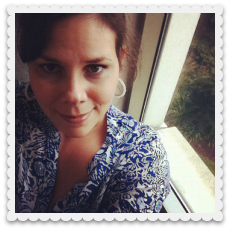 It's the creative sewing that fuels my fire. I wanted to clarify that the baby sweater in my last post is NOT for me. No way! I did do exactly what I said that I wouldn't - I cast on another sweater. 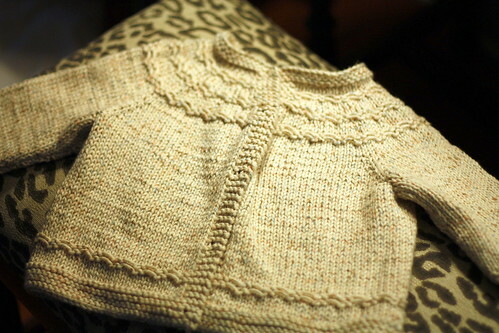 I loved that baby sweater so much that I had to start making one for Ava. It's what has been keeping me occupied these last few nights as I decompress from the day. I'm sizing it up to a 3T-4T on the fly, which had me worried, but after joining it under the arms and slipping it on her, it looks like it'll fit just fine. I'm making note of my changes to the pattern on my ravelry page. It's been a little while since I updated you on my knitting progress, so what the heck! This weekend I finished up a quick little project - a Seamless Yoked Baby Sweater. This could have been a quick knit, but I started it, put it down, got busy with my redecorating, then finished it up. I still need to wash it and sew on the buttons, but I'm calling it finished. It's 100% cotton and so soft. I really love the yarn. In fact, I loved it so much I bought more to make Ava a sweater from it. And it's not expensive yarn either, it's that Hobby Lobby "I love this yard" brand. This sweater is supposed to fit 0-6 months, but it looks huge to me. Maybe after a wash and run through the dryer it will fit a little better. Once I finished that, as tempted as I was to cast on a new project, I looked around at all the unfinished works-in-progress I had and decided to work on one of those instead. My goodness, I have a lot of WIP's - right off the top of my head I can think of 5, not including this one. Okay, no more new knitting projects until I finish what I've started! Well, maybe not finish everything, but at least a few. This sweater is based on the Deep Breath sweater I finished a few months ago. 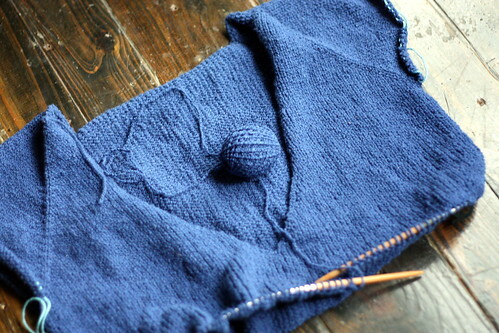 It will be a v-neck elbow length sweater. 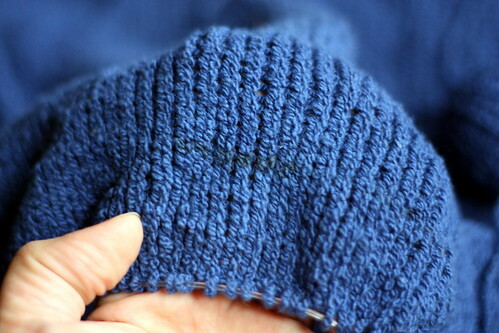 I'm using Elann Esprit in French Navy. Interesting yarn. It has elastic in it, so it's stretchy. I think this weight will be great for my climate. I should be able to wear this sweater all year long. Yes, the continuous stockinette stitch is somewhat boring, but it's perfect for tv viewing and decompressing. When I knit, my mind wanders. I don't think I'll ever be able to do something that requires too much concentration. I had quite a productive weekend. I was all about working on my home dec projects. At this point I want it DONE so that I can move on to other things. 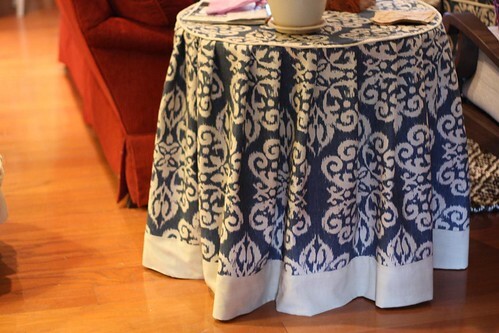 The table skirt. I started it last week by cutting out the top and sewing on the cording. A traditional table skirt, made from a big 90" circle would have taken too much fabric, which is why I went with this design. Due to the repeat of the fabric, I had to add a band at the bottom to give it enough length, I like to call this a design feature. I am very pleased with how this turned out. I simply eyeballed the pleats, which is good enough in my book. Next up was 2 more pillows (pictured is 1 of the 2, sorry for the dark photo). These were made from some left over linen from my dining room curtain panels. I wanted to add a bit of red to help tie in my red sofa with my new blue/linen color scheme, so I added a frame of red linen-like fabric to the center. I'm only 'okay' with these, but I think they'll grow on me. 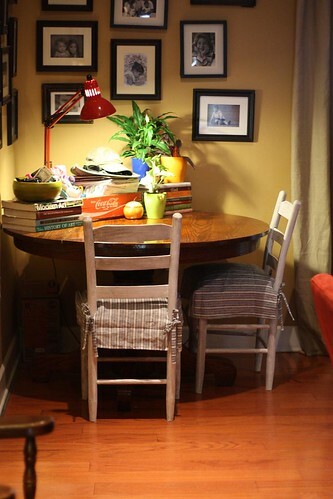 And lastly, I spruced up the two chairs at the corner table. To continue with my lighter and brighter theme, I started by white washing a pair of old wooden chairs. 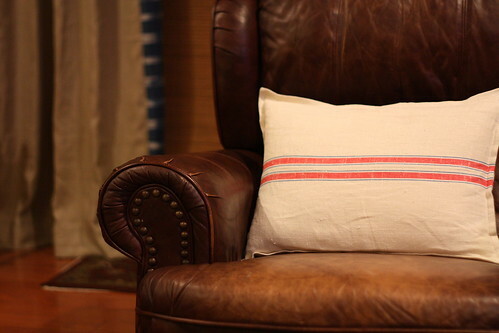 I then made a simple seat cover by using some left over blue striped linen fabric that I had purchased for sofa pillows. Under the cover is a squishy 16" down pillow form left over from my old sofa pillows. 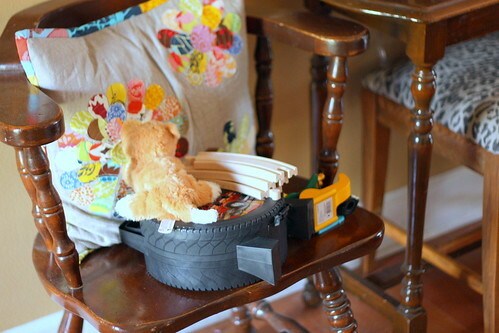 I feel quite thrifty transforming those chairs with stuff I had laying around. I really really really wanted a pair of tolix chairs right here, but $500 vs free? No question! 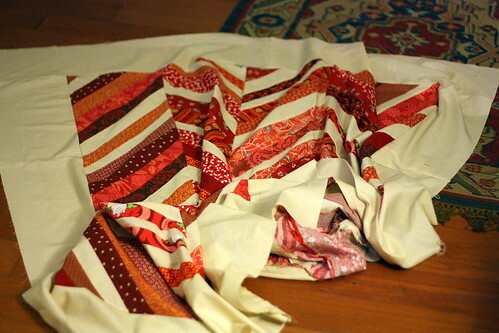 At one point this weekend I felt like finishing my red quilt, but after all that, I was spent! By Sunday evening I had finished my laundry, done the dishes, had the house fairly picked up, and settled down to watch Mad Men in peace. It was a good weekend, indeed! **I'll show you the whole room once I get it finished, until then I'll just tease you with bits and pieces! 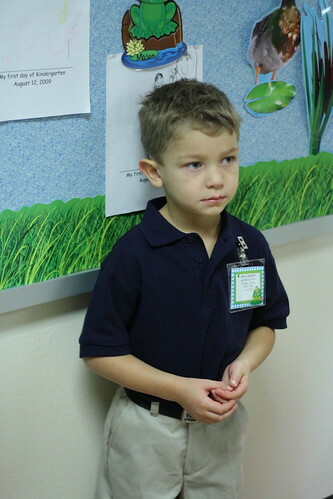 Today was Alex's first day of kindergarten. I'm pretty sure I was more nervous than he was, maybe. I've been through this before, it shouldn't be a big deal, but it was different. Lily and Alex are very different. I never worried about Lily. She was almost grown up the day she was born. Alex is much more reserved. 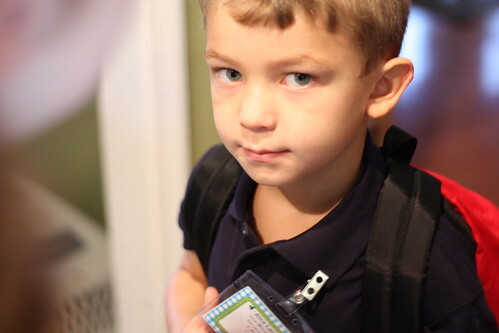 When I woke him up this morning he had a little tantrum saying that he did NOT want to go to school today. He eventually warmed up to the idea, after I bribed him with after school cookies. He didn't say much all morning long. I think he was a little freaked out when we walked in the building and there were so many kids. 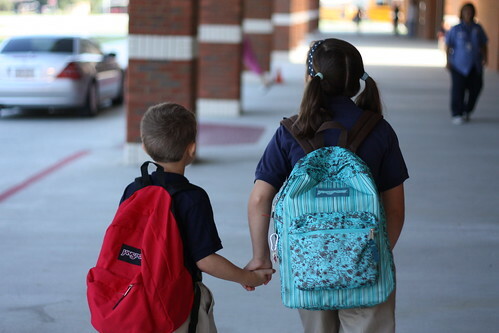 Thankfully, this was a low key day for kindergartners. There were only 5 other kids in his class. His group was the last to start - other kids had their first days on Wed. and Thurs. On Monday the whole class gets to meet, all 17 of them. And he gets to ride the bus. We made it through today, but Monday starts a whole new adventure. I think he'll do just fine. Hi there. Ms. Boring here, or at least that's how I feel these days. 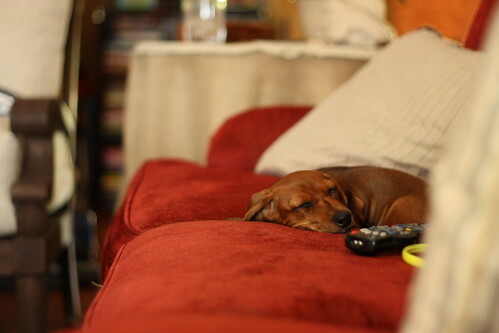 We're slowly trying to get back into a routine before school starts, so not much exciting has been going on. Speaking of which, Matt (a teacher) started back on Monday, Lily starts tomorrow (Wed) and Alex starts on Friday. Yep, Alex is starting kindergarten. Wow. I now have two kids in school. Kind of crazy. 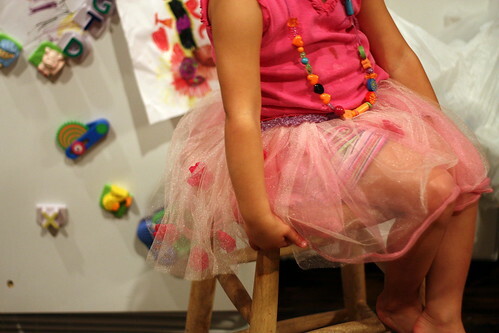 When Lily started kindergarten Ava was an infant, so I didn't have time to feel emotional. This time is different. I think I'll join the other moms for the boo-hoo breakfast after dropping him off at his classroom. 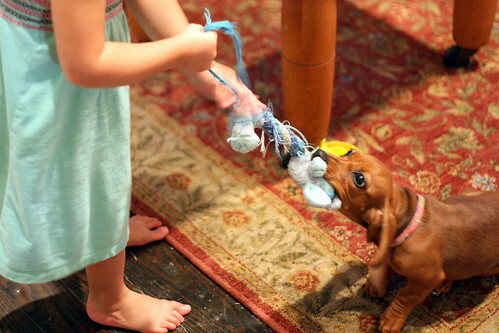 Little Miss Ava has been entertaining us thoroughly lately (nothing boring about her!). She's all about dancing and performing. 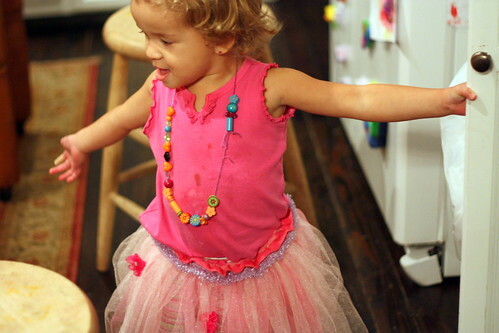 Her new tu-tu is getting lots of twirls. That girl. 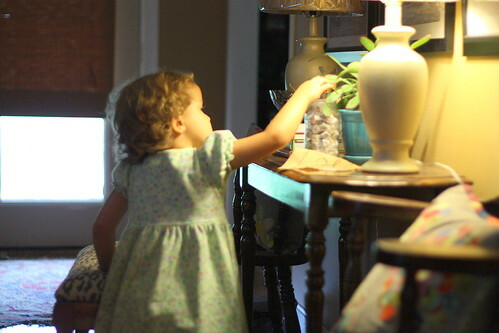 Before I know it, she'll be off to kindergarten! Okay, okay, I won't get ahead of myself *sniff sniff*. 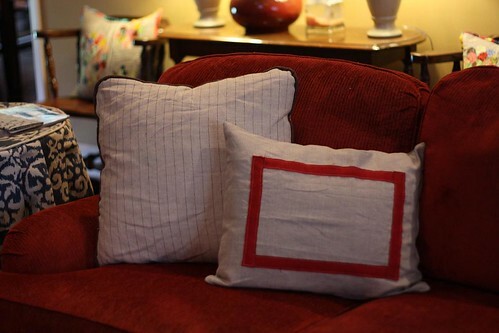 On the sewing front, I have been busy at my machine making throw pillows for my living room. I'm still working hard on the new look. Linen pillows, how I love thee! I guess they're kind of boring, but I love them. I still have a few more to make before I'm done. I have to say, throw pillows are quite satisfying, almost instant gratification. I like small projects that I can complete in a short amount of time. Makes me feel productive. I still have a table skirt to make for the room, but I've been procrastinating on that one. Throw pillows are much more fun. Oh, and if you were wondering, the applique pillows are still in the room - there's no way I'm getting rid of those babies!